Adult lady bugs have a very distinctive appearance; they have a dome-oval shaped body and are usually red, orange, or yellow and have black spots on their bodies. Lady bugs have short antennae and their head can tuck underneath their neckline-either partially or completely. The lifecycle of a lady bug includes four life stages: egg, larvae, pupal, and adult. Lady bug larvae are segmented, soft-bodied, bristled, and are mottled gray, black, tan, or gray. 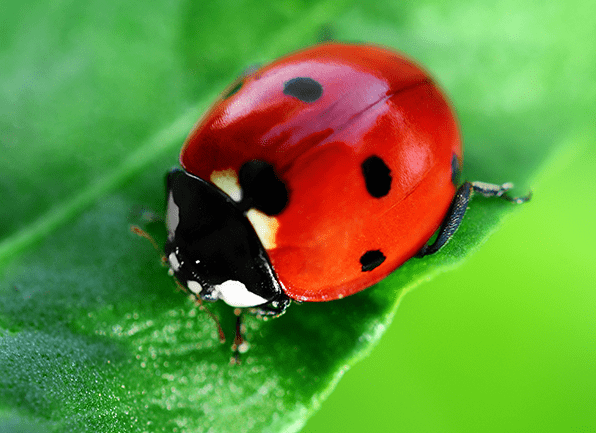 Lady bugs are considered to be a beneficial insect because they help to control aphid populations by feeding on them. Lady bugs are attracted to the sunny, warm sides of buildings making their way inside through cracks and crevices found in exterior walls. Once inside, lady bugs find their way behind walls, inside attics and crawl spaces, behind window frames, and underneath floors. When lady bugs are found in very large numbers they can leave behind an odor that is likened to burned rubber or hot tar. In the spring when the weather warms up they will move back outside in order to begin feeding, mating, and laying eggs. Inspect the exterior walls of your home or other buildings sealing any cracks or crevices that are found. Caulk gaps found around windows and doors; install door sweeps underneath all exterior doors, especially basement doors. Make sure that vents have a secured cover over them and that chimneys have caps on them. Fill in spaces found around utility lines and pipes. Trim back trees and bushes from the exterior of your home; place garden areas a distance away from the exterior of your home.